south-east of the town as it then existed, on the London Road. neither are currently in use. CWGC Records state that "Buxton Cemetery contains 54 scattered burials of the First World War, 29 of them Canadian; a Canadian special orthopaedic hospital was at Buxton in 1917-19 and the town was No 1 Canadian Discharge Depot. 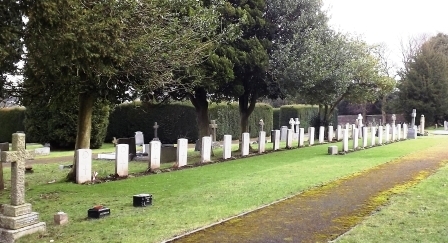 The cemetery also contains 22 Second World War burials, some of them made from the RAF station that was at Harpur Hill at this time." 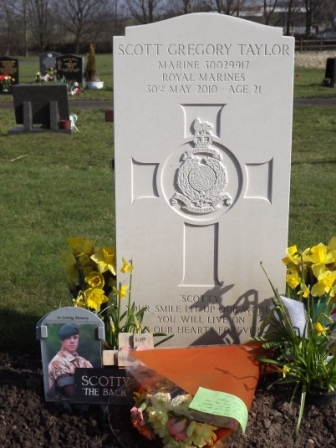 Whilst it is true that graves are scattered, there are two specific plots containing Commonwealth War Graves In addition, burials are found in private graves, plus family graves with commemorative inscriptions. 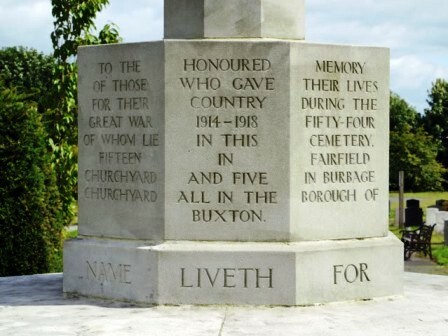 The memorial consists of the Cross of Sacrifice on a hexagonal base, which bears an inscription on the base of the Cross, including the 54 World War 1 casualties in Buxton Cemetery, plus 15 in Fairfield Cemetery and 5 in Burbage. Twelve of the men commemorated on Buxton Memorials are buried in Buxton Cemetery, having died at home in the town or in UK Hospitals and returned home for burial. Some have 'official' CWGC headstones; others were buried in private, 'family' graves. Private 301865 WILSON, Tom Clarence, Manchester Regiment. Five other Buxton men, however, are buried in the Cemetery, yet are not Commemorated on any of the town's War Memorials, some as their dates of death were after the closing dates for inclusion, and even after the Memorials were unveiled. There could have been personal or family reasons for others to be omitted. Sergeant Major 75011 William Henry CHAPPELL, Derbyshire Yeomanry, died 18th August 1920, aged 36. Private 2580 John Henry LAKIN, Manchester Regiment, died 21st May 1918, aged 22. Lance Corporal 50620 James WILDS, Royal Defence Corps, died 10th February 1918, aged 31. As well as local Buxton burials there are eight other UK casualties (as opposed to Commonwealth) in Buxton Cemetery. Presumably, these men were serving in the area or were admitted to local Hospitals and, rather than being repatriated to their home area, were buried in the town where they died. CLICK the name below to go to each man's CWGC Record. 18 men from the Buxton area died during The Great War, either at home or in English Hospitals, and were brought back to the town for burial. There are a further 12 Second World War burials, Army, Navy and Air Force, UK based. a number of graves in the Cemetery have commemorative inscriptions for local men buried or commemorated in overseas theatres. including Marine Scott Taylor, killed in action in Afghanistan in 2010. Sapper 107946, Edward DICKINS, 283rd Army Troops Company, Royal Engineers, died of Influenza, 7th April 1916, aged 35, in Buxton Cottage Hospital and was interred in Buxton Cemetery on the 10th April 1916 in Grave 1986. Edward (Dickens) was born in the December quarter 1876, the son of John and Hannah Dickens. In 1911 (Census RG 14/8521) he was sharing a house at Court 5, 2 House Jacksons Lane, Wellingborough with Florence Bessie Bidgood, who he married on the 30th January 1916 at Wellingborough. When he enlisted in 1915 Edward was living at 38 Grove Street, Wellingborough, Northamptonshire, employed as a 'Bricklayer'. After his death his wife received a pension of 10/- [50p] per week. After she remarried Walter Pook in the June quarter 1923, she gave the CWGC an address at 27 Chapel Street, Tiverton, Devon. Edward enlisted at Chatham, Kent, on the 3rd December 1915, aged 37 yrs. 1 mth. The absence of a Medal Index Card suggests he did not active Service abroad with his Company, although another member of the 283rd Company, who enlisted around the same time as Edward, was posted to France on the 8th May 1916. By this time, however, Edward had become ill and died in Hospital in Buxton. Private 51796 William KNOTT, Royal Defence Corps, Formerly: Private 4285, Cheshire Regiment, who died on the 24th July 1918. William was born in Manchester and at the time of his re-enlistment was living at Hillgate, Stockport. His Service Number with The Cheshire Regiment suggest that he had enlisted about the middle of 1893. However, another Cheshire Regiment man who served in the Boer War had the same number, so William could have been re-issued the number on his Great War. He has no Medal Index Card indicating that William did not serve abroad. The Royal Defence Corps was a corps of the British Army formed in August 1917. It was initially formed by converting the (Home Service) Garrison battalions of line infantry regiments. Garrison battalions were composed of soldiers either too old or medically unfit for active front-line service. The role of the regiment was to provide troops for security and guard duties inside the United Kingdom; guarding important locations such as ports or bridges. It also provided independent companies for guarding prisoner-of-war camps. The regiment was never intended to be employed on overseas service. Sapper 92866 George JENNINGS, 213th Army Troops Company, Royal Engineers. He is recorded in the SDGW database as dying at 'Home' on the 2nd March 1916. Aged 39. George was born in the June quarter 1877, the son of Ann Jennings. In 1901 (Census RG 13/2931) he was living with his widowed mother and elder brother, William, and younger sister, Rose, at 22 Chesham Court, John Street, Leamington, employed as a 'Plumber'. A comparison of Service Numbers would suggest an enlistment date of the middle of 1915. Corporal 260377 Francis LOCKARD, 323rd Quarrying Company, Royal Engineers, died on the 14th April 1917, aged 42. He was the son of Mrs Annie Lockard, of 8 Laburnum St., Connswater, Belfast. 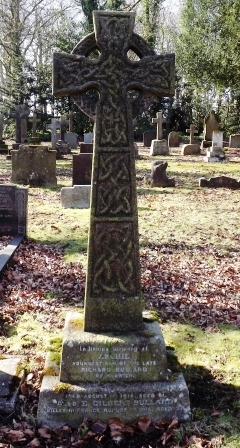 Francis enlisted at Paisley, Renfrewshire, and at that time was living in Wallace Tree Terrace, Elderslie, Renfrewshire. His son, Pt. 3932 Thomas Lockard served throughout the War in France with the Argyll and Sutherland Highlanders. Francis has no Medal Index Card, indicating he did not serve overseas, and no doubt died of illness whilst training with his Company in Buxton's quarries. Private 16778 Joe PEARSON, 1st Battalion, East Yorkshire Regiment. [Formerly: Pt. 34425 York and Lancs Regiment.] Died in Buxton 4th June 1920. Joe was the son of Sarah Anne Pearson of Alfreton, Nottinghamshire. When his brother Pt. 4841 Charles Pearson, 4th Battalion, Sherwood Foresters, enlisted in August 1914, Joe was already a Serving Soldier, and his Medal Index Card shows that he was posted to France on the 23rd June 1915. When Joe died he was a 'Class Z' Reservist. When the Armistice was signed there were fears that Germany would not accept the terms of any peace treaty, and so soldiers who were being demobilised, particularly those who had agreed to serve "for the duration", were at first posted to Class Z. They returned to civilian life but with an obligation to return if called upon. The Z Reserve was abolished on 31 March 1920. As he died after this date, Joe might have moved to Buxton to live after demobilisation. When reporting Joseph's death in its edition of 5th June 1920, 'The Buxton Advertiser' gave his address as West Street, Buxton, and that he had served for 4½ years in the Army, 3½ of which were in France, and he had been wounded twice. 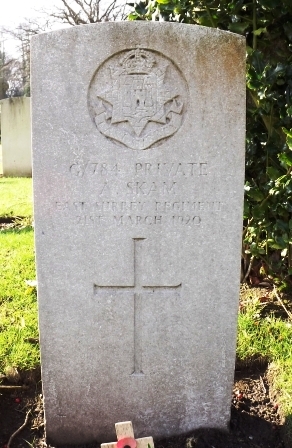 Private G/784 Arthur SKAM, East Surrey Regiment, who had transferred to Pt. 322568 Labour Corps, and died on the 21st March 1920. Arthur Skam, was born in Hackney, Middlesex in 1861, the son of William and Sarah Grace (née Mason). The 1891 (Census RG 12/) shows him living at 71 Layspring Road, Leyton, Essex, with wife Mary Catherine (née Cashen), son, Arthur E. and daughter, Maud C. The 1901 Census (RG 13/938) shows his status and occupation as 'Boarder' and 'Traveller' and resident at 82 Goldstone Villas, Hove, Sussex, with 16 year old son, also Arthur. Probate Records show that Arthur left £100 to his wife, Emily. [There is no record of Arthur's wife Mary's death, nor a re-marriage to 'Emily'.] At the time of his death he was living at 1 Bridge Street, Buxton, but when he arrived in the town, with whom and where he worked has not been ascertained. There is no Medal Index Card nor SDGW reference for Arthur, indicating he did not serve overseas, but bearing in mind his age - 53 in 1914, this is perhaps not surprising. Whilst his Service Papers have not survived. those of five others with similar service numbers (781 - 789) indicate that they all enlisted in September 1914, often on an Army Reserve (Special Reservists) Attestation, after being long-term serving soldiers, but no longer on the General Reserve, hence their ages. Sapper 740 Benjamin SMITH, 2nd/1st North Midland Field Company, Royal Engineers. Died 16th August 1915. Benjamin was the son of Benjamin and Sarah Ann Smith of Walsall Road, Great Wyrley and later of Queen Street, Cheslyn Hay, his father, who predeceased him in 1900, was an "Iron Worker". He was living at 82 New Street, Bridgtown, Staffs., and was a single man who had a daughter, Florence Ann Smith, born on Sunday 26th November 1911, who lived with his brother, Charles Smith, at 9 Walsall Road, Churchbridge, Cannock. A general labourer in an iron works, Benjamin enlisted in the Army at the Drill Hall, Norton on Sunday 6th December 1914 and was drafted to France on Monday 1st March 1915. His Medal Index Card shows that he entered France on the 1st March 1915, which coincides with the entry into the War of the 46th (North Midland) Division, to which his Company was attached. The North Midland Division was a formation of the Territorial Force and as such was the first T.F. Division to arrive complete in a theatre of war. Benjamin was admitted to hospital with suspected bronchitis on Sunday, the 9th May 1915 and was transferred to the 13th Stationary Hospital on Tuesday, the 18th May 1915. He remained in hospital until removed to England on Saturday, the 22nd May 1915. Private 26894 Hugh THOMAS, 13th Battalion, Lancashire Fusiliers, transferred to Pt. 219208, 360th Reserve Employment Company, Labour Corps. Died 30th June 1917, aged 26. Hugh was the son of John and Cathrin A. (née Robinson) Thomas, later of 54 Humphrey Sreet, Orrell, Bootle, Lancashire. In 1911 (Census RG 14/22794) the family were living at 152 Elephant Lane, Thatto Heath, St Helens, Lancs, where Hugh was employed as a "Coal Miner Colliery Haulier". Although his Service papers are not available, from his Service Number it would appear that Hugh enlisted in the Lancashire Fusiliers in October 1915. The fact that he has a Medal Index Card indicates he served abroad, although the did not enter France with the 13th Battalion, which spent the War in England. At some time he was transferred to the Labour Corps and assigned to the 360th Reserve Employment Company at Strensall in Yorkshire. The Labour Corps was made up of men who were not considered fit enough to serve in the front line as infantry. By comparing Service Numbers, this transfer took place around the time of his death. Hugh now lies in Grave 1925 in Buxton Cemetery. N.B. The above three men were all enlisted in the Royal Engineers - see also Spr Benjamin Smith, below. There is much evidence that the R.E. used the area around the town for training and they were billeted in private houses in Buxton. The 327th Quarrying Company were based there until being sent abroad in June 1917, as was the Officer Commanding, Royal Engineers (Roads). A series of postcards were produced in Buxton during World War One. They show soldiers from the Royal Engineers practising building bridges and pontoons across the lake at the Pavilion Gardens. The soldiers based there used them to write home. It is not surprising that men of these Companies were taken ill and died whilst stationed in the area. They undoubtedly enlisted in the 3rd or 4th Battalion, East Surrey Regiment, both in Kingston-upon-Thames and both depot/training units. When men joined the newly formed service battalions for wartime service only had their numbers prefixed by G/ (for General Service). At some stage Arthur transferred to be Pt. 322568 Labour Corps. How he ended up in Buxton is not clear, but probably moved after the War and died of a War related cause. 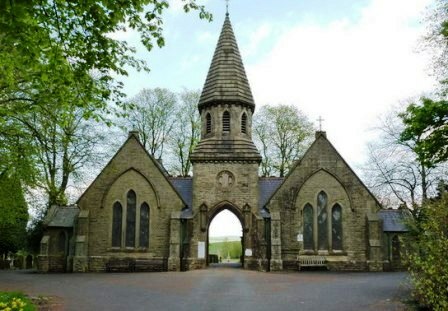 Buxton Cemetery contains the family graves of many of those killed in action and buried near to where they fell or succumbed to their wounds. 2nd Lt. Gerald Wallace ADAM, Leicestershire Regiment - commemorated on parents' grave. L/Cpl. Thomas Henry FARLAM, 4th Battalion, Grenadier Guards, commemorated on parents' grave, along with his brother. Captain Haddo DRUMMOND-FRASER, Cheshire Regiment - commemorated on parents' grave, along with his brother. Private Ernest Edward (Edwin) HOLMES, 10th Battalion, East Yorks. Regiment, also on parents' grave. L/Cpl. Percival INNES, 3rd Battalion, Middlesex Regiment, on mother's grave; father interred later. Brothers Private Joseph KEELING, 8th Battalion, North Staffordshire Regiment, and L/Cpl. Sydney Thomas KEELING, 13th Battalion, Northumberland Fusiliers are both named on their mother, Mary Emma's grave. Their father Joseph was buried in the same grave after his death in 1928. L/Cpl. Allen REDFERN, 1/6th Battalion, Sherwood Forester Regiment, also on his parents' grave. Private Brian Haigh SMITH, 1/7th Battalion, King's (Liverpool) Regiment, is commemorated on the grave of his brother, George Millward Smith, who died in 1930. Capt. Geoffrey Yates HEALD, 15th Battalion, Lancashire Fusiliers, who was killed in action 1st July 1916, has no real link to the town but his commemorative cross is leaning against his family grave in Buxton Cemetery. Service. He died on the 1st August 1915 and is buried in Grave V.A.25, Merville Communal Cemetery. brother Archie in Buxton Cemetery. Even so the family have a very ornate family grave - as shown on the right. Benjamin is next recorded as being admitted to the Devonshire Hospital, Buxton on Friday, 16th July 1915. He remained in hospital until he succumbed on Monday, 16th August 1915 suffering from ascending myelitis, an infection or inflammation of the white or grey matter of the spinal cord, which is a part of central nervous system that acts as a bridge between a brain and the rest of a body. Benjamin was buried in Buxton Cemetery in Grave 2143 during Friday, 20th August 1915. He was 32 years of age. In both World Wars Buxton served as a Hospital base, mainly for Canadian Forces. Thirty-six of these patients and staff succumbed to wounds or illness in the First World War and were laid to rest in Buxton Cemetery, and 7 more in World War 2, all from the Royal Canadian Air Force. There are, in addition, three Second World War burials from the Royal New Zealand Air Force. Details of these losses have been moved to a separate page. after completing his GCSEs and A-levels at Buxton Community School. 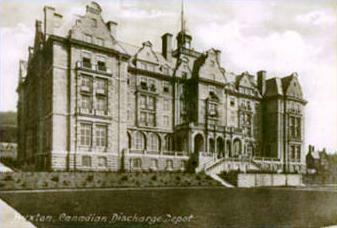 such as the Canadian Discharge Hospital, pictured right. The stories of these Hospitals clearly have a bearing on the Cemetery. Details of these hospitals have been moved to a separate page. 'The Buxton Advertiser' (15th April 1916) reported that Edward had been buried "with full military honours" on Monday, 10th April 1916, with the Rev. J. Coulthurst officiating. A firing party of 12 men from the Royal Engineers fired three volleys over his coffin, which was draped in the Union Jack. Edward's widow, mother and sister were in attendance. 'The Buxton Advertiser' reported George's death in its 4th March 1916 edition. At the time he was billetted in The Grosvenor Private Hotel, Broad Walk, Buxton, and was found dead, in the bathroom at 8.20 on the evening of Thursday, 2nd March 1916. "He had been out working with his Company the same day. ... It is thought that death was probably due to heart seizure". It also stated that George's brother, William, was in the same Company. The following week George was buried in Buxton Cemetery, Grave 1987. He had been removed to the Elms Infirmary, Chapel-en-le-Frith "… just over a week ago suffering from pleurisy and pneumonia. …. Mr. Pearson was very seriously ill on his admission …. Death supervening in spite of the best attention."